Santa’s Secret Adventure was formed in 2008 with the thought of bringing a little Christmas cheer to families that seemed to be emotionally down and out at the beginning of the great recession. The event had a very meager beginning as a small event that sold out each and every ticket. We were so fortunate to bring smiles and happiness to so many families that year. We knew after the success of the first year along with some of the heartfelt stories we needed to keep it going. We decided that we must add new and additional ideas to the event each year to build family’s memories. Well the rest is history now we have families coming from hundreds of miles away let alone other states to experience Santa’s Secret Adventure each year. Whether you have attended each year or this will be your first year we hope you enjoy Santa’s Secret Adventure. Santa’s Secret Adventure is held at one of the area’s top equestrian centers here in Penryn Ca. We’re located 2 miles off highway 80 just past the Cities of Roseville and Rocklin. Here in Horse Country you won’t find stop signals or street lights to guide you so keep this in mind while driving. Santa’s Secret Adventure is a labor of love trying to show children and their families there’s more to life than shopping malls and smart phones. Here you’ll find an old style event that is put on by a family and many local teenagers that enjoy being in the Country atmosphere at Christmas time. Santa’s Secret Adventure is a quaint experience it’s not run like a carnival or fair there are a limited number of children and adults at each arrival time. Most new families comment about how it is not crowded and by the time they finish the event they understand why and there’s nothing like it. We like to refer to the event as old style and what we mean by that is most of the event revolves around animals and the children’s inner action with them. There are a few things the adults are involved in but the true joy is seeing the wonder through you’re children’s eyes. We are not Disneyland nor have an endless budget. The ideas and decorations are home grown. You won’t find venders here trying to sell you anything this is an event that has no pressure other than you keeping track of the children and making sure their being safe and well behaved. What you can expect is fun and a wonderful memory for the Holiday Season. The one big reason we have such a following is the setting where your family will experience Santa and Mrs. Claus. It is located in a 120 year old barn that is dimly lit to enhance the experience. 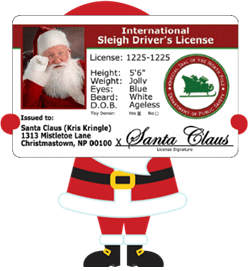 What is different is Santa takes the time to talk with the children about family, doing well in school, chores, always doing their best, or anything else he can get them to talk about. This event is enjoyable for all that bring their old fashion Christmas spirit, for most the memory will last a life time. If you’re looking for a plastic mall experience or the Disneyland affect that’s not us. If Grandpa is grumpy and would rather be watching TV at home don’t bring him. If Dads or Moms have worked too much and are too tired don’t come. But if you enjoy the outdoors with bon fires, hot chocolate, horse drawn carriage rides, pony rides, a personal experience with Santa and Mrs. Claus and much, much more then we invite you to come join us for a unique memory filled adventure. Ticket prices are a direct result of the cost it takes to put on the event by a small business that has only 12 nights to recoup their investment. We wish we were a large company able to absorb cost over the scope of year’s business. To some the tickets may be more than they can afford, to others they see the value Santa’s Secret Adventure offers their families. If you are a family with a special needs child don’t hesitate by thinking this event may not be suitable. We welcome all and are able to facilitate your needs. We understand that some children have difficulties but we strive to make the event memorable for everyone!